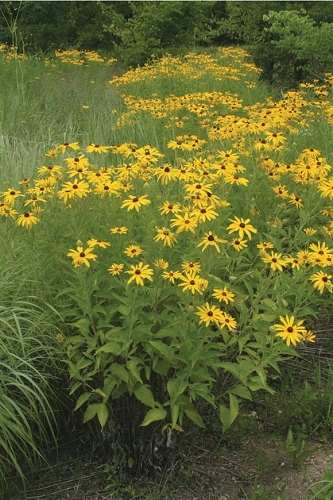 Of the "black-eyed susans," Rudbeckia hirta is the species most commonly grown in cultivation even though it is a weak perennial and is best grown as an annual or biennial on sunny, dry sites. In contrast to R. hirta, sweet coneflower (R. subtomentosa) is a long-lived perennial that would make a great addition to the rain garden. 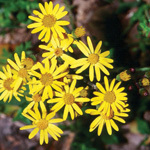 It competes well with other vegetation, forming large clumps with many stems. Years ago here at the nursery, one plant with 50 stems was growing happily in a fescue field. 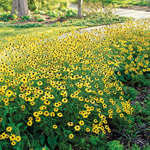 Put this plant in the back or middle of a perennial bed, or treat it as a small shrub in your yard. 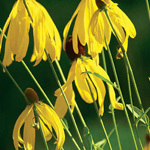 Sweet coneflowers are great for flower arrangements as the cut flowers can easily last 10 days.